The pack attaches to the pack frame on top of the main pack or is donned and doffed over the FLC. The exterior sides and outermost surface of the patrol pack contain PALS webbing to accomplish secure attachment/detachment of the modular pouches/pockets and other individual equipment items/carriers i.e., mattax, entrenching tool, two-quart canteen, etc. The pack is accessible through the top and has a flap covering the opening and providing water resistance. There is a non-reflective slide in name holder for name identification on the exterior of the pack. The pack has drain holes. There are four black metal loops at the top of the back panel of the pack. These loops are attachment points for the shoulder straps. The two outer loops are to provide better compatibility with bulky armor or clothing, and the inside loops are used for narrower chest and neck circumferences. 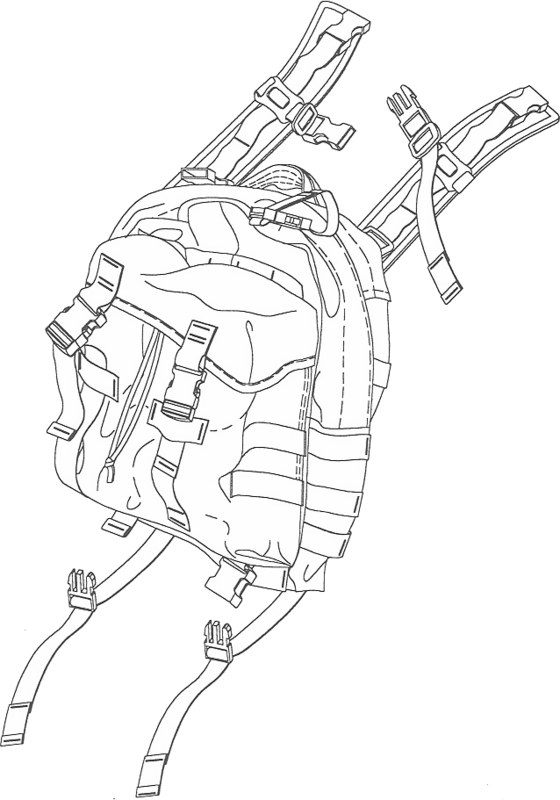 The pack has two 30" type 8 webbing for direct attachment to the parachutist snaphook described in FM 3-21.220 pg 12-5, item #17, for integration with the T-10 Harness Assembly described on pg 2-2 item #14.